View the data story here. Read the latest HDI Trends here. Read about our story here. “Measuring America: 10 Years and Counting,” the latest update to the American Human Development Index by Measure of America (MOA) of the Social Science Research Council, moves beyond the overreliance on GDP as the primary measure of human progress and well-being in the U.S. MOA introduced the American Human Development Index in 2008, using official government data to create a composite rating of overall well-being based on health, education, and income, which enables comparisons over time and across race and ethnicity, place and gender. 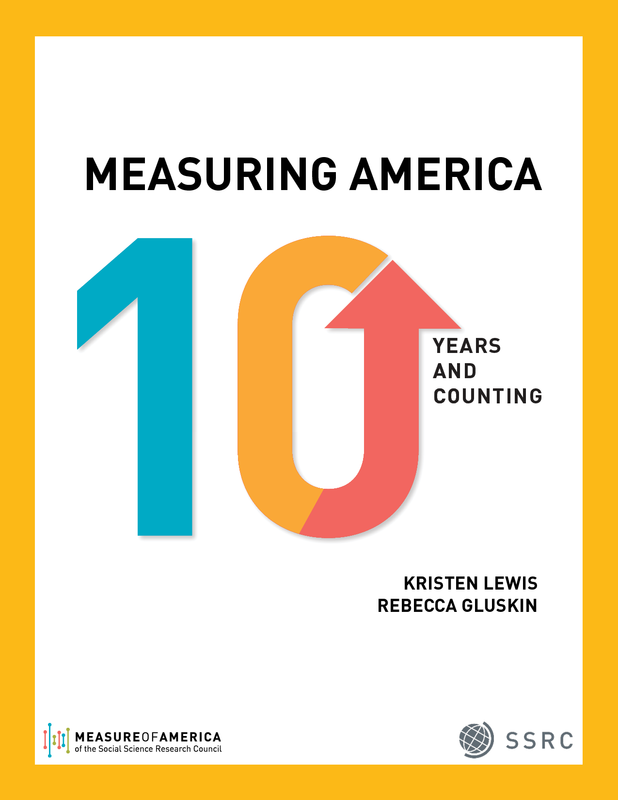 “Measuring America: 10 Years and Counting” explores trends in American Human Development Index scores over the past decade by race and ethnicity, gender, and U.S. state, revealing the uneven nature of America’s rebound from the 2007 financial crisis. The American Human Development Index for the United States as a whole is now 5.21, an increase of 6.4 percent over its score of 4.89, when it was first calculated in 2008. Women edge out men slightly, scoring 5.23 to men’s 5.20; women have better health and educational outcomes, but men earn more. When the Index was first calculated, men had a higher score than women. Education is the component of the Index that has improved the most over the last decade. Asian residents have the highest score, followed by whites, Latinos, blacks, and Native Americans. In 2005, black residents had the lowest score; today, Native Americans do. Asians, the top-scoring group a decade ago, also have the highest well-being score today, 7.69. Asian men top the chart with a score of 7.82, followed by Asian women, with a score of 7.31. Whites have the second-highest score, 5.63. Whites also had the second-highest score in 2005. White men score 5.67, white women, 5.58. Although white men still outscore their female counterparts due to the former’s much higher wages, white women’s well-being has improved at a quicker clip over the past decade. White women’s score improved by 10.5 percent, but white men’s score improved by just 3.27 percent—the smallest improvement of any group except for Native American men, whose score actually decreased. So while white men still rank third on the well-being chart—after Asian men and Asian women—the gap between them and white women, black men, black women, Latino men, Latina women, and Native American women has narrowed since 2005. Latinos rank third overall, with a score of 4.59. Latinas have a higher score than their male counterparts, 4.65 compared to 4.37. Blacks rank fourth on the national list with a score of 4.02. The well-being scores of black women and men diverge more than those of any other racial and ethnic group; black women score 4.49 and black men score 3.57. Black women have seen some of the largest well-being gains over the past decade. Their score has increased by 17.5 percent since 2005; only Latinos made faster progress. Black men’s score has also improved, but by much less, 7.1 percent. Native Americans have the lowest score of the country’s major racial and ethnic groups, 3.69. As with black residents, Native Americans see a sharp gender divide. Native American women score 4.00, Native American men, 3.29. While women’s score has increased by 9.5 percent over the last decade, outpacing national improvements, Native American men’s score declined by 7.9 percent since 2005. They are the only group whose well-being score fell over the last decade. Native American men (3.29) and black men (3.57) have well-being scores similar to those that prevailed in the US in the late 1960s. Life expectancy in the US is now 79.4 years, an increase of 1.6 years since 2005. American women outlive American men by five years—81.9 as compared to 76.8. Asian women enjoy the longest lives by a huge margin; their life expectancy is an astonishing 90.5 years. An Asian baby girl born in the United States today can expect to live 17.8 years longer than a black baby boy born in the United States today, the largest life expectancy gap by race/ethnicity and gender. White men (76.6), Native American men (73.4), and black men (72.7 years) have the shortest lives. For the nation, the Education Index score increased over half a point, from 4.70 in 2005 to 5.24 in 2016, an 11.6 percent increase. Both women and men’s scores improved over the past decade, but women’s scores increased twice as fast. Women ages 25 and up have become slightly more likely than their male counterparts to have graduated high school and earned bachelor’s and graduate degrees. Girls and young women are now also slightly more likely to be enrolled in school than boys and young men. Among racial and ethnic groups, Asians have the highest Education Index score overall, 7.33. This represents an increase from their 2005 score of 6.72. Asian men outperform Asian women in education, scoring 7.62 as compared to 7.10. Asians are the only group in which men have higher education scores than women. More than half of Asian adults have at least a four-year bachelor’s degree. Although Latinos still have the lowest education scores among the major racial and ethnic groups they have made astonishing progress over the last decade. Their score increased by 45.4 percent, four times greater than the increase in the national score. Median personal earnings is the only component of the Index to have decreased nationwide over the last ten years. US median earnings were $33,288 in 2005 (converted to 2016 dollars) and $32,024 in 2016. In every racial and ethnic group, men earn more than women, though the size of the gap varies. White women saw an earnings gain of $2,042, the largest boost of any race-gender combination. Asian men’s earnings increased by $1,784, Latina women’s by $1,016, and Latino men by $620. Black women saw their wages decline by $364, and white men saw theirs drop by $1,544. The greatest wage declines, more than $3,300, were experienced by Native American and black men. Today, the highest American Human Development Index scores are found in Washington, DC (6.92), Massachusetts (6.36), and Connecticut (6.31). The lowest scores are found in Arkansas (4.17), Mississippi (4.05), and West Virginia (3.94). The greatest increases in American HD Index scores occurred in Washington, DC, Wyoming, South Dakota, Louisiana, and Mississippi. Curiously, this list includes both Washington, DC, which ranks first in the country, and Mississippi, which ranked last a decade ago and ranks fiftieth today. Generally speaking, states in the Northeast are faring the best, while Southern states are struggling. Most states are better off today than they were a decade ago; Washington, DC, and 44 states saw increases in their HD Index scores. Six states saw no significant change in their HD Index scores: Michigan, Alaska, West Virginia, New Hampshire, Vermont, and Rhode Island. Measuring America: 10 Years and Counting was made possible by the generous support of the Conrad N. Hilton Foundation. An initiative of the Social Science Research Council, Measure of America provides easy-to-use yet methodologically sound tools for understanding the distribution of well-being and opportunity in America and stimulating fact-based dialogue about issues we all care about: health, education, and living standards.